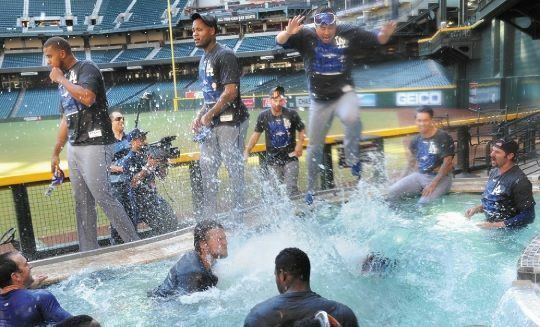 No matter what the bean-balling bullies in Arizona think, the Dodgers deserved a dunk in the outfield pool at Chase Field. What better way to thank the D’Backs for the inspiration to take this season all the way to the end? In early June, the Boys in Blue were written off as basement-dwellers after the most dismal April and May that I can remember. The Diamondbacks were smugly lording their first-place position over us, throwing balls at the players’ heads and sneering at the Dodgers’ high payroll and higher expectations. That brawl on the field at Chavez Ravine — the most violent diamond fight since Roseboro and Marichal — sparked a fire in the Dodgers’ hearts. It was the turning point, just like in a movie, where the heroes turn it around and start winning game after game, with a soaring John Williams soundtrack in the background. So the hard part is over, the even harder part is about to begin. One day at a time, one game at a time, one inning at a time. Some of my former colleagues at the Los Angeles Times, from left, Carlos Lozano, Hector Becerra, Bob Pool and Paul Pringle. It was old home week at the Ravine last night. I went to the game with my friend Debbie, who had gotten two-for-one tickets after asking Mercury Insurance for a quote. We were in the Reserve Level, and we ran into friends everywhere we turned. First, a bunch of reporters and editors from my old stomping grounds, the L.A. Times, came for a boys’ night, but we crashed their party and were with them for the thrilling 11th inning, when Scott Van Slyke channeled Kirk Gibson and pinch-hit one into the Dodger bullpen, giving the Blue Crew a 5-3 win over the D’backs. Before that, Debbie and I had roamed the stadium getting different vantage points of the game, but when we finally settled in our own seats, right across the aisle was Gigi, a friend that works at the Downtown Independent, and her husband. We visited with them for a few innings before heading for my favorite spot, the Top Deck, where my usual homies — the ones who do the very lively Adrian Gonzalez dance (with choreography and everything) — have taken over the top of Section 3. 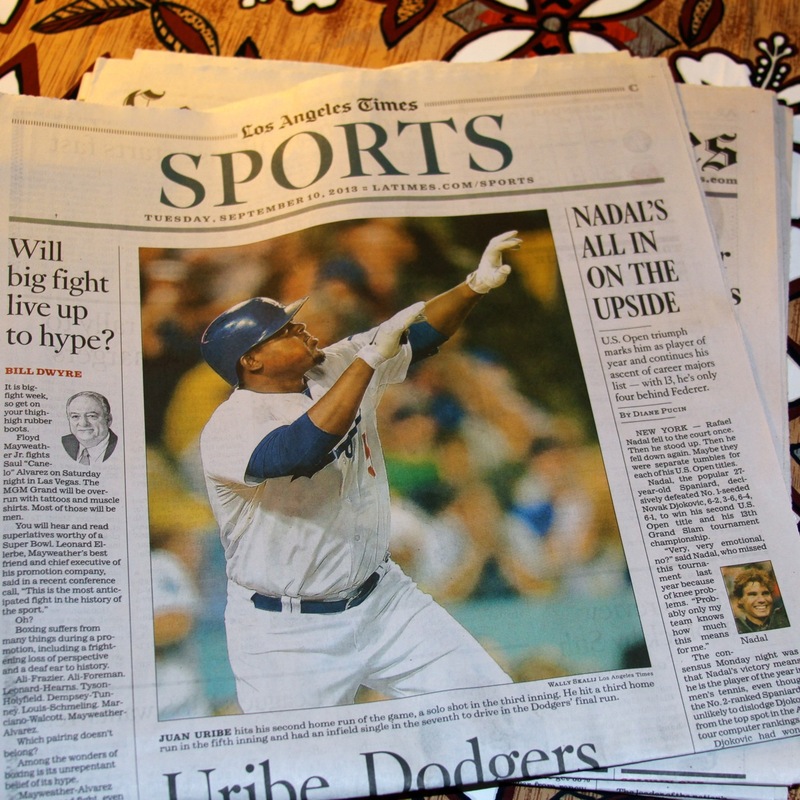 This is a crazy crew of characters, whose only common bond is an undying love of the Dodgers. These are the Top Deck irregulars: all have had season tickets for years, if not decades; they come to virtually every game, day or night; they know all the security people and ushers on a first name basis. Other than an occasional visit from Steve Lyons, who has friends in Section 1, no big shots come to the Top Deck. You can’t get a glass of wine on the Top Deck, or even a pretzel. There are no tchotchke kiosks, no programs, no “healthy alternative” food choices. But the view — and the company — are unrivaled anywhere in the stadium. 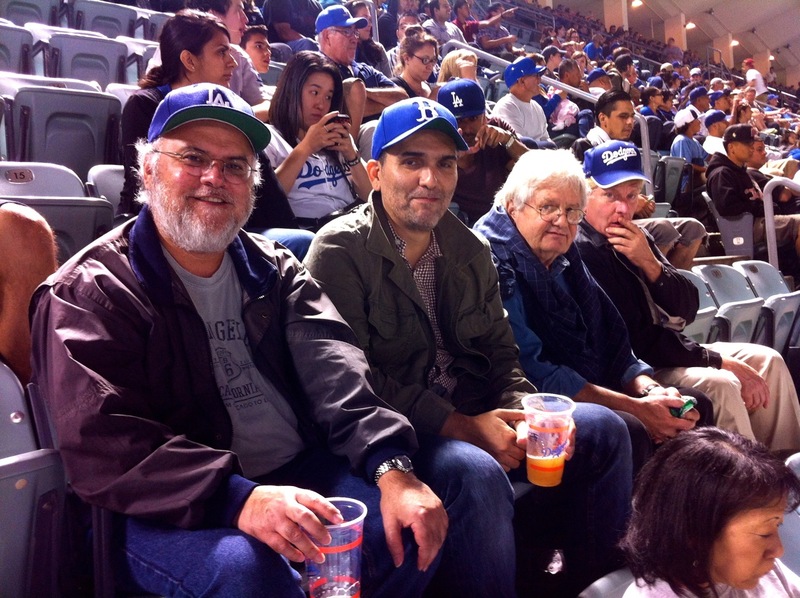 After a stop at the Top Deck beer stand where my friend Rosa works, we headed back to the Reserve Level and the Times boys to watch the very satisfying — if protracted — dénouement, which left the Dodgers only six from clinching the division title.